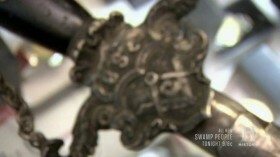 Rick and Corey check out a sword belonging to the Freemasons. Will the guys be able to sneak in an offer or will negotiations get chopped? Then, Corey and Chumlee play with the idea of scoring a Gibson Master Museum guitar. Stamped with the serial number 1, how far will they go to pluck out this rare instrument? And later, Chumlee tries to prove he deserves a raise, but will his weaknesses outweigh his strengths?